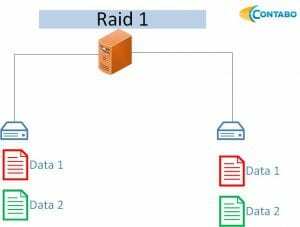 With this tutorial we will explain certain types of RAID levels to you. Some of you might have already experienced a loss of data, no matter if it was an SD card holding some vacation photos or a hard disk holding important files. Losing data can be very costly if you try to restore them by some specialist. An expert is needed and the procedure takes a lot of time, the easiest way to avoid those costs is simply to avoid any data loss in the first place. This overview is not relevant for any VPS, your VPS systems are already running safe on a RAID system monitored by experienced technicians. Creating backups is still very important, a RAID does not replace any backup! There are some points which you should think about first, there are several results depending on your requirements. How important is the performance? 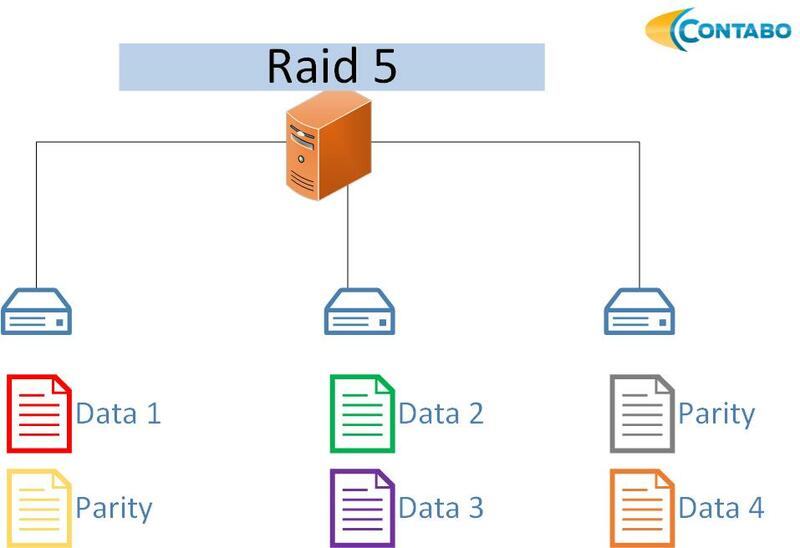 How much data security should be provided by the RAID? A hardware RAID is always more expensive but provides the best performance and security (if combined with a battery backup unit). 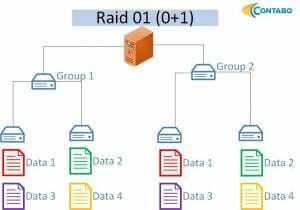 A software RAID is the easiest way to go for a RAID, it is able to handle almost any type of RAID and can be set up within a few minutes. The RAID 0 provides increased write and read performance, the data will be distributed to at least two disks. Since there is no redundancy all data will be lost in case one disk fails. The RAID 1 provides increased read performance (depending on the software/hardware controller used), all data will be mirrored to a second disk. There is also a RAID 1E available - in that case all data will be mirrored to additional disks too. The RAID 5 provides increased write and read performance, the data is written to at least two disks, an additional disk is always used for storing parity data. The parity data has to be calculated for every write - so for very write intensive applications the RAID 5 requires a lot of performance due to the necessary calculations. The RAID 6 provides increased read performance, the data is written to at least two disks, two additional disks are always used for storing parity data. The parity data has to be calculated for every write - so for very write intensive applications the RAID 6 requires a lot of performance due to the necessary calculations. As there are two parity bits saved on the disks, the needed CPU time is very high. 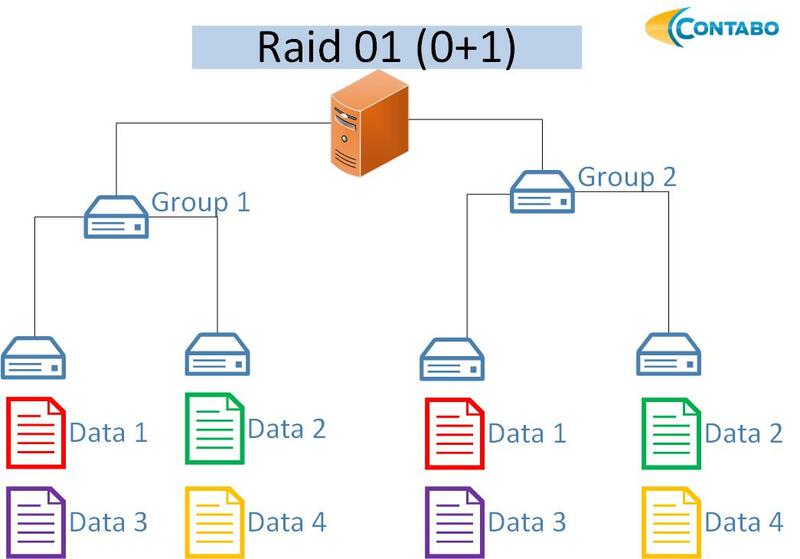 A RAID 01 is a combination of two or more volume groups. 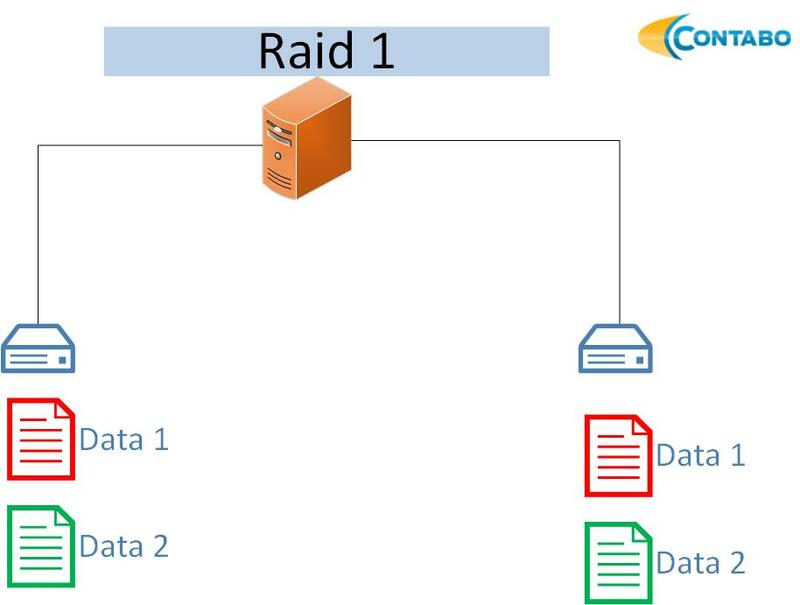 Each volume group is configured to have a RAID 0, those volume groups are mirrored in a RAID 1. With a total number of four disks one entire volume group can fail with both disks and no data will be lost. 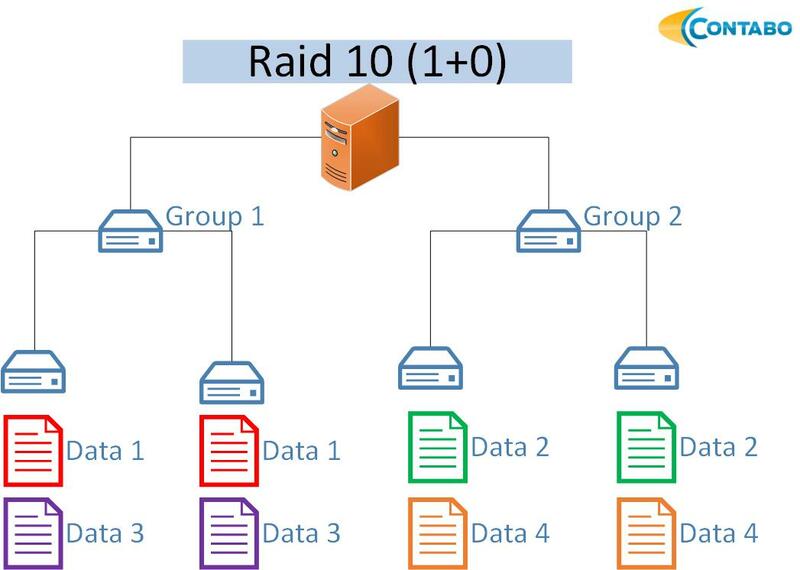 A RAID 10 is a combination of two or more volume groups. 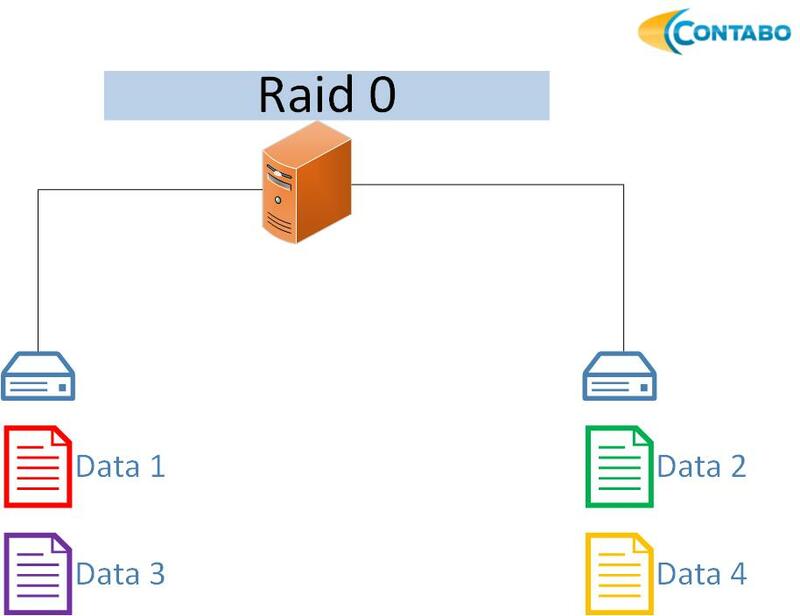 Each volume group is configured to have a RAID 1, those volume groups are striped in a RAID 0. With a total number of four disks, two disks can fail simultaneously and no data will be lost - the failed disks must not belong to the same volume group. 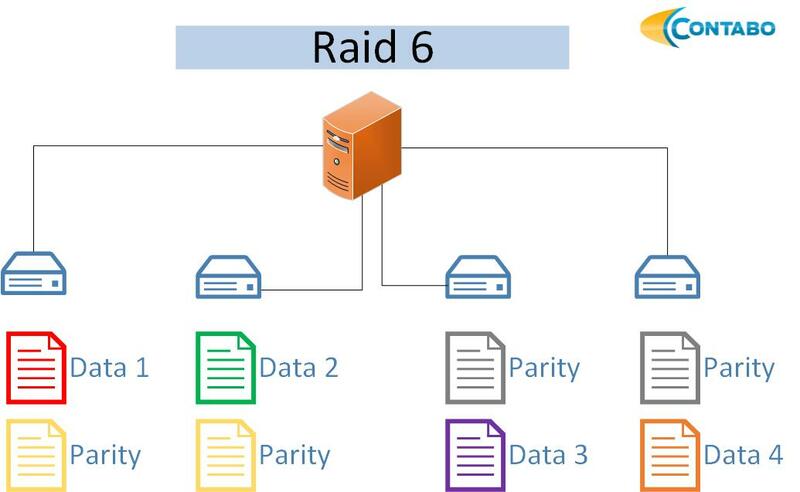 The difference between RAID 01 and RAID 10 is only visible with six or more disks, if you have six disks a RAID 10 will provide a higher calculated security rate. We do recommend using a RAID 10 instead of using a RAID 01 even if you do only have four disks. Some RAID controllers do not even support a RAID 01 anymore. RAID 5 and RAID 6 require the highest CPU time since a checksum has to be calculated on every writing process to the disk. 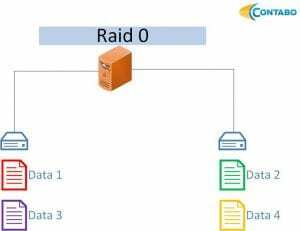 Only a few enterprise RAID controllers do support RAID 5 and RAID 6, due to the need of calculating checksums the writing speed might suffer which might then cause problems when using write intensive applications. For our dedicated servers it is always possible to order additional hard disks or RAID controllers, current prices can be found on our web site. If you need a special configuration, please contact our support team any day between 8 am and 11 pm (German timezone, UTC+2).